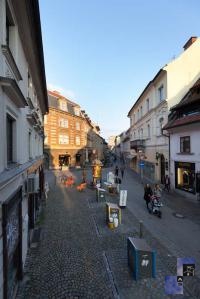 Apartment is located in the historical centre on lovely Trubarjeva Street lined with traditional houses, cafes and boutiques, just a minute of walk from Preseren Square and the famous Triple Bridge. One bedroom apartment is on the 1st floor in a low building from 19th century with no elevator access. It was recently completely renovated. Rustical kitchen with dining corner for 4 persons is fully equipped with refrigerator, glass-ceramic cook-top, microwave oven, dishes and cutlery. From the kitchen we proceed in a room with two single beds (90 x 200 cm) which can be divided or set together. In the living area there is a working corner, LCD TV and comfortable sofa, which can serve also as additional bed for 1 person (180 x 130 cm). From the kitchen area there is a small hallway with spacious closet and access to the bathroom with bath, toilet and sink. The apartment is provided with towels, linen, iron with ironing board, hair dryer, CATV and Wi-Fi internet access and air condition. The private parking lot is approx. 150 m away from the apartment (only for personal vehicles that do not exceed the usual size of 5m). Reservations must be made in advance. Daily price is 12 €.